Aasiya Hassan, left, was decapitated by her husband, according to prosecutors. A jury agreed Monday. (CNN) -- After a three-week trial and one hour of deliberations, an upstate New York jury on Monday found Muzzammil "Mo" Hassan guilty of second-degree murder for beheading his wife. In February 2009, Hassan, who founded a TV network aimed at countering Muslim stereotypes, went to a police station in the Buffalo, New York, suburb of Orchard Park and told officers his wife was dead, police have said. Aasiya Hassan had been decapitated, with prosecutor Paul Bonanno saying during opening arguments that the long knife used by her husband had left marks on his office's tile floor. Hassan gave his own closing arguments Monday. Earlier in the trial, he had dismissed his attorney, Jeremy Schwartz, who by trial's end was acting as his legal adviser. "Mr. Hassan has felt that throughout the tenure of his marriage, no one had listened to his side," Schwartz told reporters after the verdict. "It was important for him in the two hours that he had for summation to get across his side and how he saw his marriage." Hassan listened quietly to the jury verdict, Schwartz said. Hassan has the right to appeal after he is sentenced, Schwartz said. According to prosecutors, Aasiya Hassan had filed for divorce less than a week before she died. On the day she died, Aasiya Hassan agreed to take some of her husband's clothes to his office after he had moved out of their home. He had told her he would not be there, prosecutors said. "The defendant viciously killed ... and desecrated her (Aasiya's) body because six days earlier she had dared to file for divorce. Dared to seek a better life for herself and the children," Assistant District Attorney Paul Bonanno said in the prosecution's opening statement. Schwartz, then his client's defense lawyer, said in his opening statement that the couple's marriage was a "sad and unhealthy relationship" and that Aasiya Hassan threatened to embarrass his client and take away his children. "It ended with 'Mo' Hassan in fear of his very life," he told jurors. "Mo Hassan killed his wife, but he is not guilty of murder in the second degree." During the trial, Michael and Sonia Hassan testified that their father had become violent in the past, CNN affiliate WIVB in Buffalo reported. While both said the couple argued, neither recalled a case in which Aasiya -- their stepmother -- instigated a fight. Police earlier said they had responded to several domestic violence calls at the couple's home, but no one had ever been arrested. 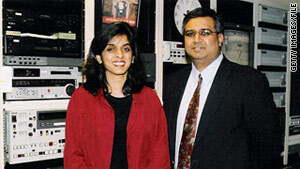 Hassan was the chief executive officer of the network Bridges TV, and Aasiya Hassan was the general manager. He launched Bridges TV, billed as the first English-language cable channel targeting Muslims inside the United States, in 2004. At the time, Hassan said he hoped the network would balance negative portrayals of Muslims following the attacks of September 11, 2001. Hassan fired three defense attorneys before the trial. Schwartz was the fourth to be dismissed, though he stayed as an adviser.